Good dog training tools are essential for a well behaved happy dog. The Coton de Tulear is a smart dog and learns quickly, but even smart dogs rely on us to teach them proper behavior. We've all had good and bad experiences with dog training methods, so let's share what works and what doesn't. No matter what breed of dog you have, they all come with their own unique personalities and may respond differently to different training methods. What dog training program do you recommend? 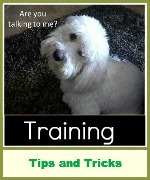 Do you have a favorite dog training DVD? Was there a program that helped with potty training your puppy or crate training your puppy? What's the best dog training book? Did any of the famous dog trainer programs work for you? Is you dog advanced? Do you have a favorite dog agility training program or therapy dog training? How did your dog learn advanced tricks? What online dog training program do you recommend? Your dog training reviews can help others. Tell us about your success stories (or failures). What worked? What didn't? Do you know about a dog training program you'd like to recommend to others? Or one that you think others should avoid? Tell us about your dog training experience below.